Review by Hannah Brattesani, photography by Lara Tillotson. Check out the show's excellent tracklist, which only added to the production's riotousness. Cause: A Friday evening spent attending a production of Jez Butterworth’s Jerusalem. Effect: I have felt the itching urge to replace all positive adjectives with “lush”. 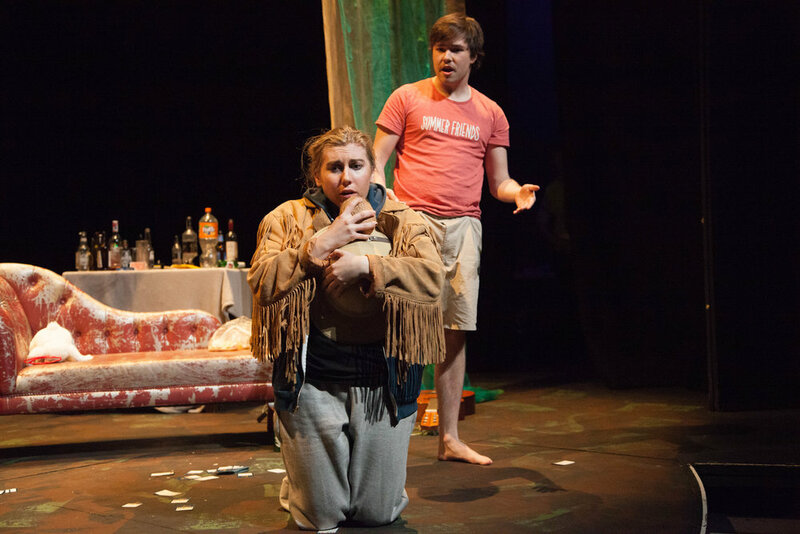 Example: The Mermaid’s performance of Butterworth’s play was bloody lush. Jerusalem, as directed by Alexander Gillespie, was a wildly entertaining reflection on British National identity. Johnny “Rooster” Byron (Hannah Ayesha Ritchie), an ex-daredevil and teller of tall tales, lives in a caravan in the forest; he hosts alcohol and drug fuelled raves that are attended by a generationally rotating cast of teenagers and, the older, Ginger (Helena Jacques-Morton), a local DJ. We meet Rooster on St George’s day, faced with the threat of eviction by the local council. The plot that unfolds is both a humorous portrayal of West Country stereotypes and a larger comment on the English idyll. The narrative and language of Butterworth’s play is strikingly masculine. Rooster is, after-all, a failing father, patriarch of a motley crew and the words that tumble out his mouth mostly serve to support his threatened machismo. Hannah Ayesha Ritchie successfully peacocks despite her lack of that action’s second syllable. (I’ll let that joke sink in for a second.) Overall the female members of the cast were hugely impressive in their portrayal of male characters. Eleanor Burke (Lee), Eilidh Mackinnon (Troy), Jacques-Morton and Ritchie made the portrayals of their character’s look effortless and natural. It was only on reflection of the performance that their genders even occurred to me, and I am delighted to see a plot that has a man in the epicentre be successfully achieved and realised by a female. My enthusiastic applause for the cast of Jerusalem does not end there. Wesley (Olli Gilford), the local pub landlord, was by far my favourite character (who doesn’t love a man in Morris dancing ribbons and bells….?). Gilford’s delivery was flawless and perfectly paced. The full extent of my laughter at plays has always been an aggressive exhale; Gilford made me audibly snort and startle the woman next to me. Every detail, from the set, to the music at the intermissions (you had me at Jefferson Airplane’s “White Rabbit”) was thoroughly thought through and contributed to the overall professionalism of the production. I left the Byre Theatre sufficiently entertained (and somewhat envious that Miles Hurley (Davey) pulls off frilly knickers better than I do) and I cannot emphasise enough how impressed I was at the performance as a whole. 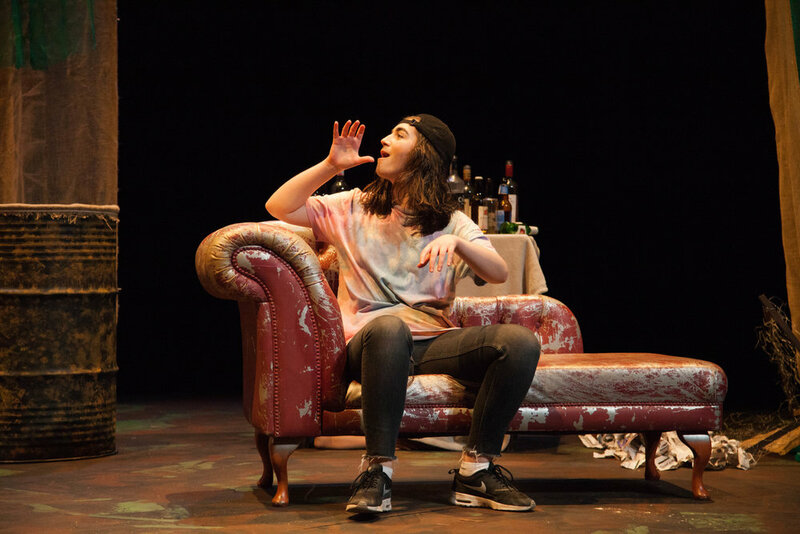 Jerusalem is not an easy play to take on; bursts of drug-induced behaviour and sustaining the balance of drama and comedy is only outmatched in difficulty by the requirement of a consistent Wiltshire accent. A huge congratulations is due to all cast and crew. Cringing in my non-wiltshireness, here’s my verdict: proper job Mermaids, Jerusalem was gurt lush.